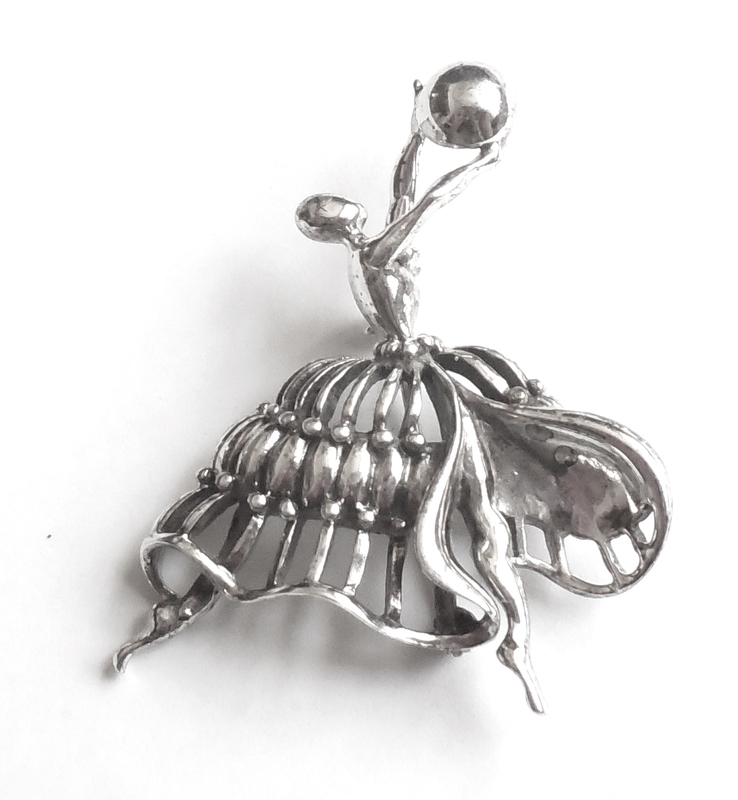 Danecraft Sterling Silver Ball Dancer Ballerina Pin Gymnast Maker Mark: Dancecraft; Old Registered R in Circle Marking Age: 1950s Metal: Sterling Silver, Solid Weight: 11.5 grams Size: 1 7/8″ tall north to south by 1 3/8″ wide across her dress skirt. Condition: Excellent, Detailed, Very Well Made, Strong. Original, No damage or repair. No alteration. 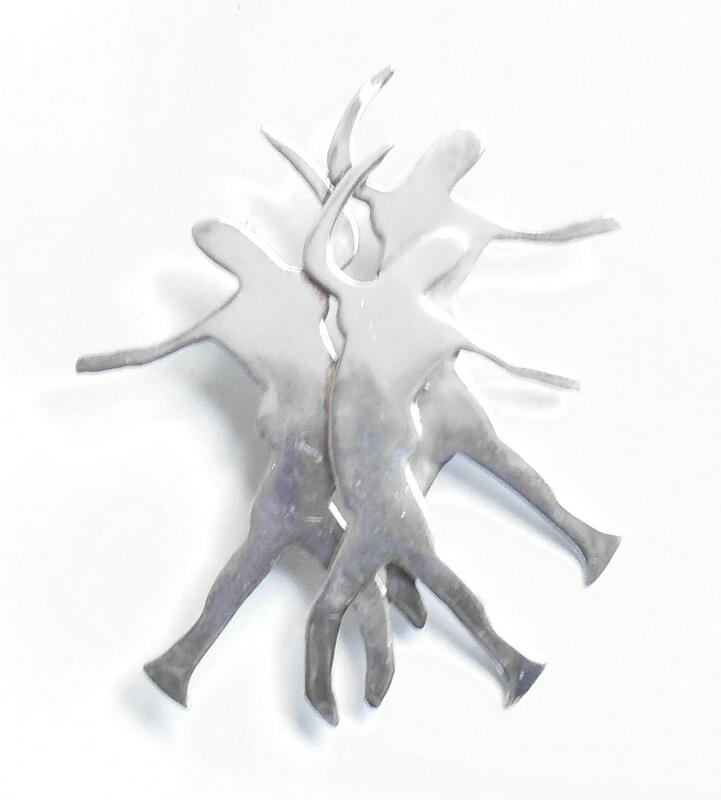 This is a very large vintage handmade sterling silver pin signed Adele with conjoined dancers in artistic silhouette form. Actually looks like a pin version of an art installation. It is marked Adele, Sterling, and is also jeweler tested and Guaranteed to be solid sterling silver. Size 3 1/8" tall by 2 3/8" across the outstretched arms in the center. It is very strong with quality hand crafting and a secure locking clasp. Weight is 18.1 grams. In excellent, gently used condition having no dents or dings or tears or repair this is a lovely showy vintage statement pin that is artist signed for your collection. Hand Wrought Jensen Sterling Silver Orchids Dogwood Pin 117 Metal: Sterling Silver Age: Mid Century Style: Modernism, Danish Modern Type: Pin/Brooch, Mid Century Estate Jewelry Maker: Georg Jensen, USA Size: 1 13/16" tall north to south by 1 3/8" wide east to west across the shoulders Weight: 8.9 gr Condition: Excellent, No damage or repair. No dents, dings, scratches or alteration of any kind. 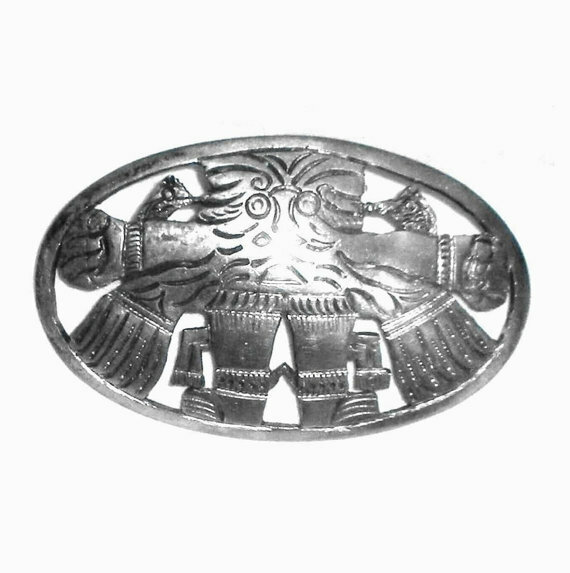 This is a large heavy vintage handmade artist signed Peru 900 Silver tribal pin in excellent, used condition. Marked 900 with artist/maker markings. Guaranteed to be solid 900 silver....not plated or filled. From an estate and has not been freshly polished. No dents or dings or deep scratches or repair. Weight is 32.9 grams. It is beautifully made with deep recesses and clean lines, not rough or messy. Size is 3" long by 1 3/4" tall. This is a lovely, quality vintage tribal statement pin for your collection. 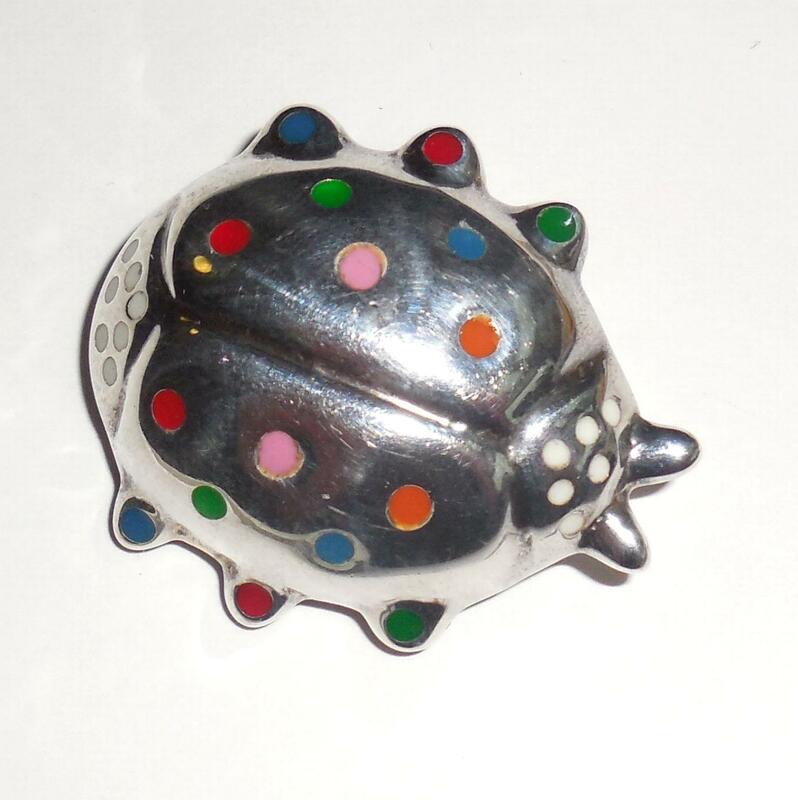 Vintage TM-11 Taxco, handmade Mexican Sterling Silver enameled ladybug pendant or pin. Size is 1 1/2" long end to end by 1 1/4" wide across the body. Height is over 1/4", very round and showy with a nice, chunky look. Weight is heavy at 19.2 grams. 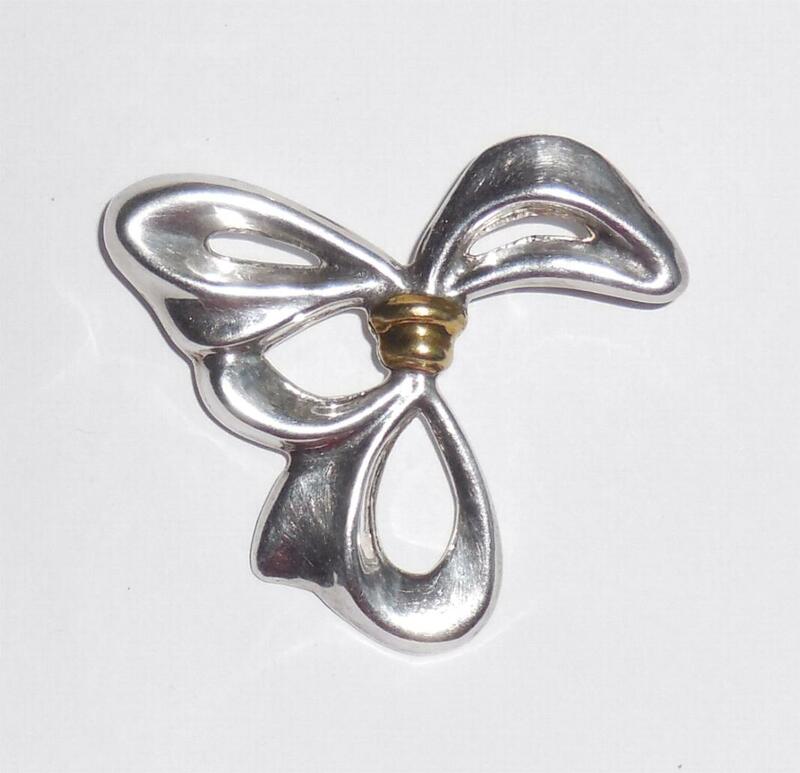 A beautiful, well made, strong and substantial pendant pin for your collection!! Please see photos and read product description for more details! This is a large dramatic chunky Mexican Sterling Silver pin with a brass center from the 1970s of a big modernist bow in excellent condition. Size is 2 1/4" tall North to South by 2 5/16" East to West. Weight is heavy at 18.2 grams. The sterling silver is very thick and solid, cannot bend it. The brass is thick and all intact. 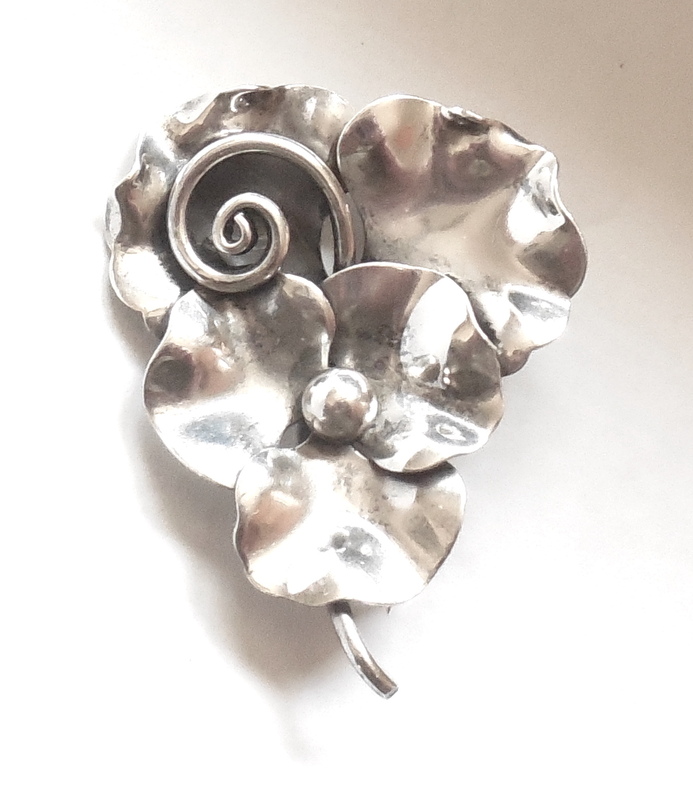 This is a lovely, very well made, late mid century pin for your jewelry collection. The bow has unusual blowing in the wind modernist design. This is large vintage hand wrought sterling silver and natural amber cab pin in excellent condition. Marked 925 on the pin rod. The amber is 25mm long and gorgeous with beautiful deep gold color and good internal characteristic with strong flecking (Russian or Baltic?). It is still very clean and clear. The pin itself is very well made and has a hand made looped rod. Weight is 11.2 grams. Size is 11/8" tall North to South by 1 5/8" wide East to West. 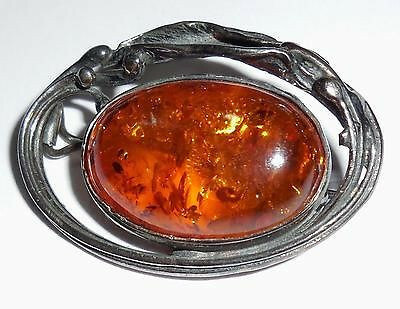 This is a showy vintage statement pin for your collection; the amber is lovely. 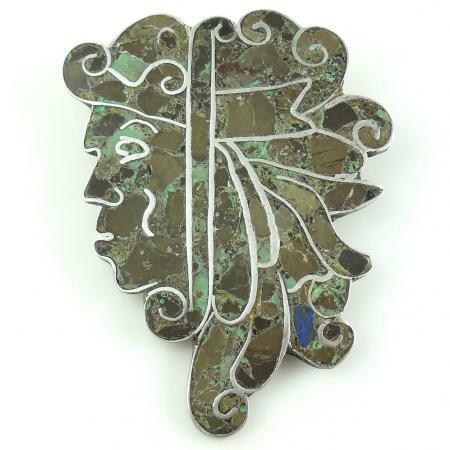 This is an older vintage Mexican Sterling Silver face pin with azureite malachite stone inlay. It is marked Sterling, Mexico(older 1950s mark), is all hand made and features a beautiful Aztec tribal face with headwear. Size is 2 5/8" from top to bottom by 2" across. It has sharp, crisp design. Condition is vintage used. It has 2 tiny 1m spots of missing surface grout from age.Very Minor - If I didn't tell you, you wouldn't find it....very tiny like 1m bubbles. The creasing you see in the photo of the back follows the sterling lines in the front and is from the original Hand Crafting. Weight is 19.1 grams. 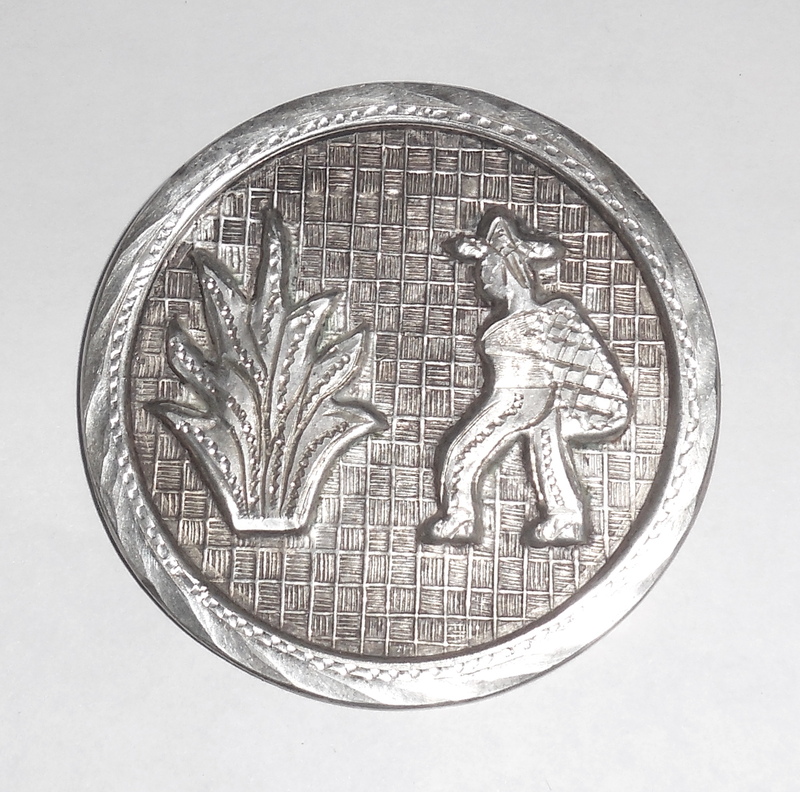 This is a large, showy, unusual mid century pin for your vintage artisan or Mexican silver collection. 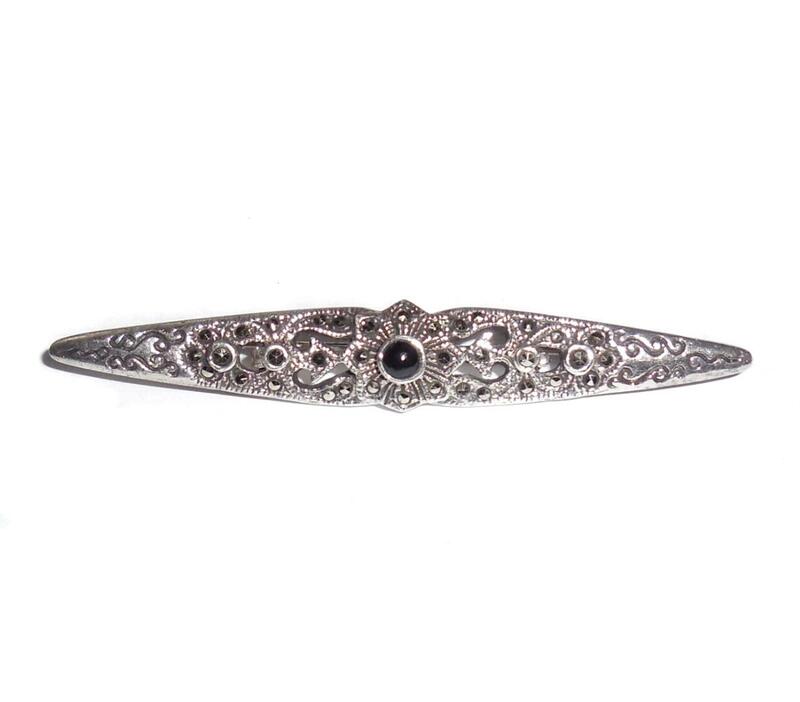 This is a vintage 1980 solid sterling silver, onyx cabochon and cut steel faceted marcasites long fancy pin. Marked 925 TH, jeweler tested and guaranteed to be solid sterling silver. It is very well made and the sterling silver is almost 2mm thick. Good strong solid quality. Size is 3" long. Condition is excellent, very gently used. No damage or repair. 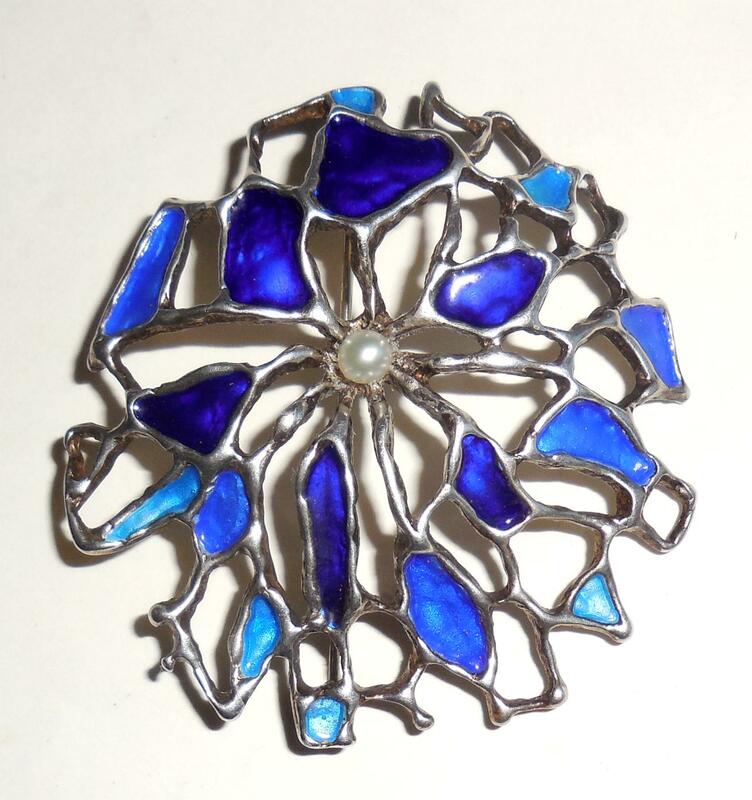 This is a lovely vintage statement pin that is showy but not gaudy and looks great on any lapel. Nice and strong so it can be used as often as you like. 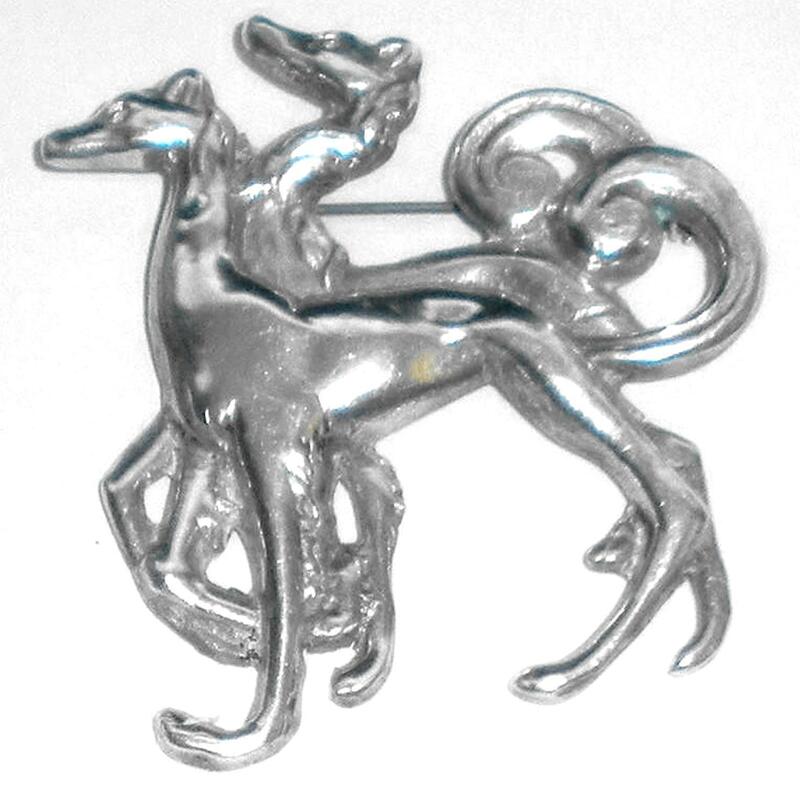 This is a large heavy vintage handmade Mexican Sterling Silver pin of 2 greyhounds or whippets. It has the old, pre 1950 Silver, Mexico marking. Tested and guaranteed to be all solid sterling silver. Some of the mark has worn with age but is still noticeable. Weight is HEAVY at 28 grams. One of the dogs is a fancy female. The other is a male. The pin is thick and the dogs have good detail. Fine quality hand workmanship. Size is 2 5/16" wide by 1 3/4" tall. A lovely pin for your collection. Condition Detials: Hand Cut, Hand Cast, Hand Finished. Excellent Condition. Light age wear. No dents or dings or repair. This is a 1990 early Michou MIchele Sonner Hand Made, sterling silver pin with beautiful artistic Balinese design and fine quality jeweling. Michou Markings and sterling markings are on the back. It has a natural 5m cream white pearl, a natural 5m silver gray pearl and a showy triangle cushion cut pink garnet. All are set into very large tall bezels to offset the stones indicative of Michou artistic forces of nature jewelry. The edge has gold vermeille. Size is 1 1/2" long by 1" wide across. Condition is excellent, very gently used. This is a gorgeous rare and hard to find Michou pin with high quality hand workmanship for your high fashion artisan jewelry collection or display. Please see photos and read product description for full information on this artist!! 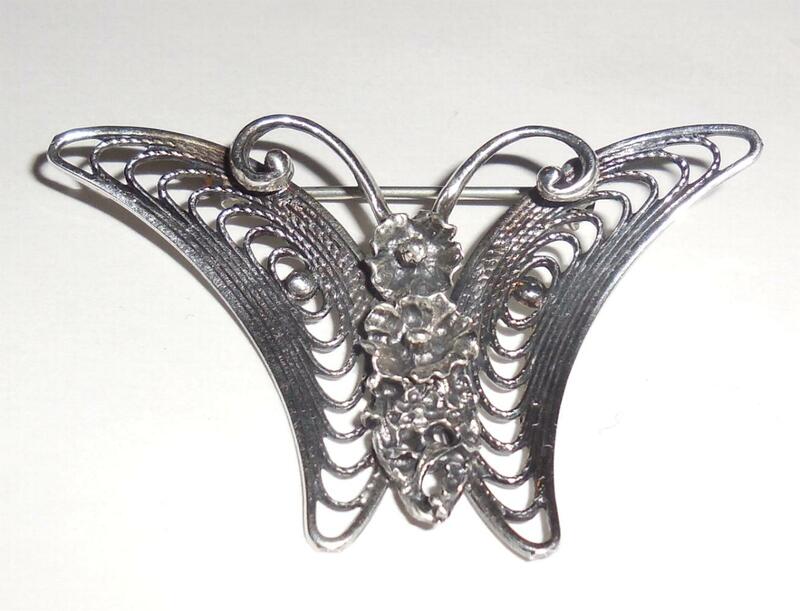 This is a showy vintage mid century Beau sterling silver modernist insect, moth, butterfly pin. Very stylized with fancy filigree and in excellent condition. Please see photos and read product description for more details. Size is 1 7/8" wide across the wing span. 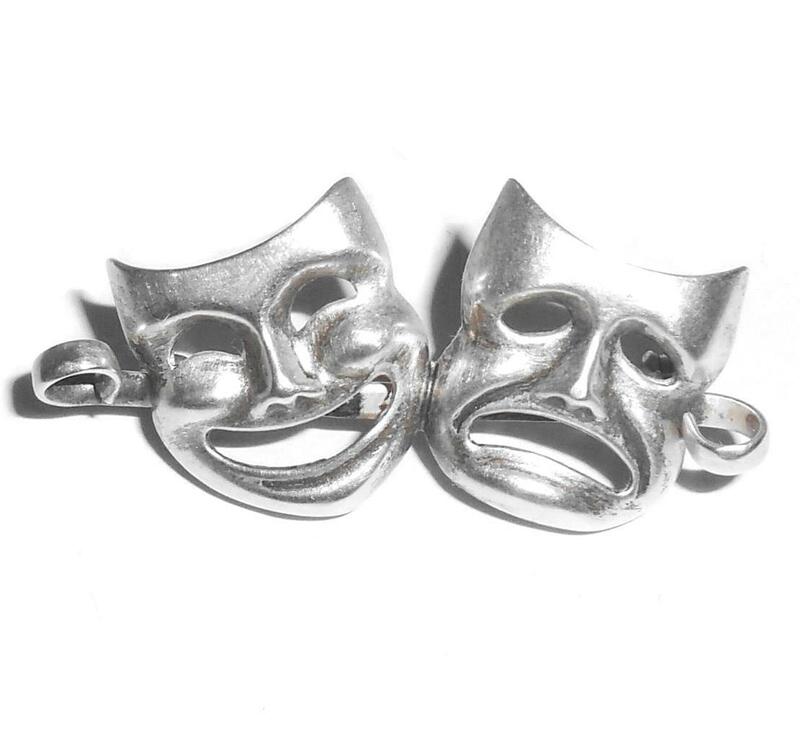 This is a vintage late Art Deco 1940s to 1950s mid century estate jewelry comedy, tragedy, theater drama, happy face, sad face pin in excellent, gently used condition. It is marked sterling (old block letter word sterling marking) and is tested and Guaranteed to be solid sterling silver. There are circular loops at the sides so it can be used as a centerpiece for a necklace. Size measures 1 11/16" East to West by 5/8" tall North to South. Indicative of its age and era it is light weight at 3.7 grams and easy to wear. Excellent, gently used condition. Well made with a support rod in the back. No dents or dings. No tears. No deep scratches. No repair or alteration of any kind. Completely original. 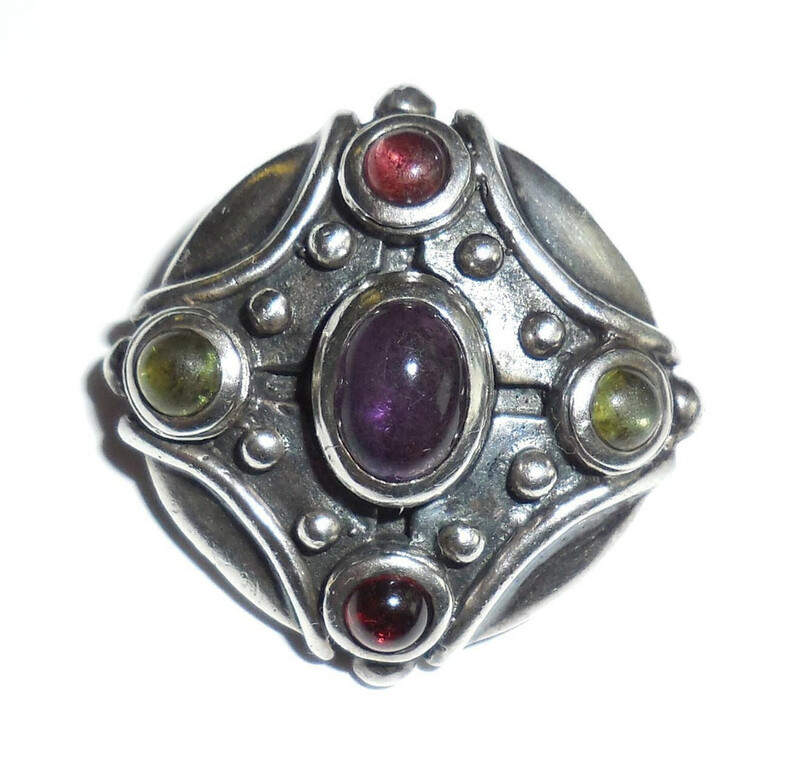 This is a lovely piece of vintage symbolic jewelry for your collection. 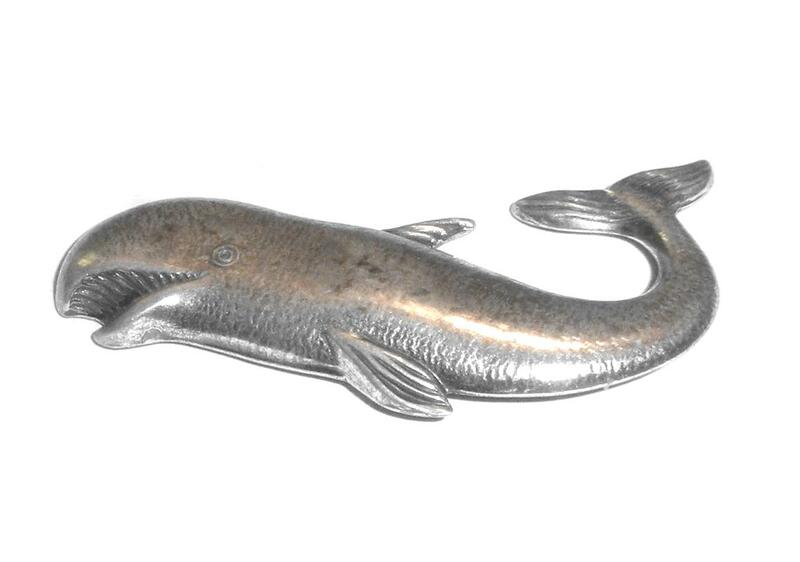 Vintage 1950s mid century Sterling Silver whale pin signed with the early Reg Danecraft marking (registered trademark/older Danecraft mark). Solid sterling silver. Hammered and detailed with large open mouth a teeth.. Size is 1 7/8"by 5/8". Excellent, gently used condition. No dents or damage. No repair. 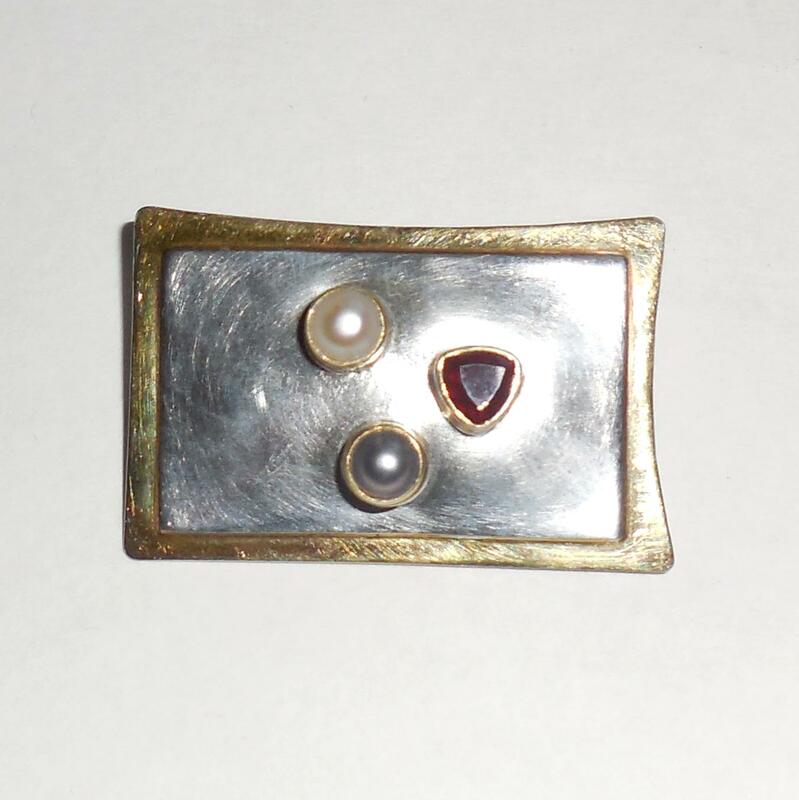 Lovely vintage statement pin by a well know mid century maker for your collection. 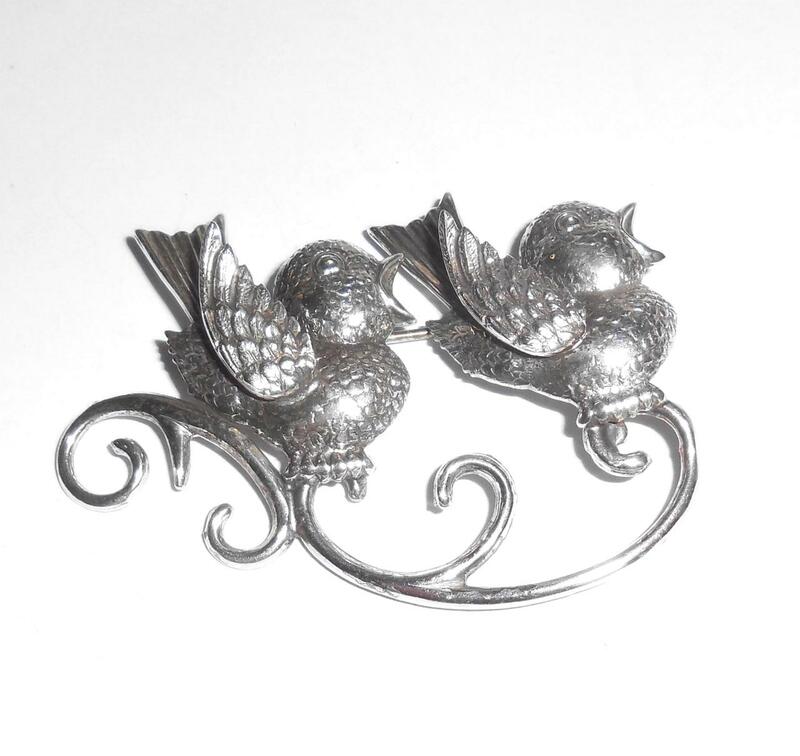 This is a lovely large mid century sterling silver singing lovebirds, robins or doves pin made by Lang. It is Marked Lang, Sterling and is tested and Guaranteed to be solid sterling silver. It is quite large, showy on any lapel and beautifully detailed. Size is 2 3/16" by 1 1/2". Weight is 9.7 grams. Good locking clasp and easy to wear. One curve at the bottom has a small indent that is not obvious when worn. Excellent used vintage condition. No cracks, tears, deep scratches. No repair or alteration of any kind. All original 1960s estate jewelry. Sure to put a smile on anyone's face this is an absolutely adorable showy mid century pin with very intricate casting for your vintage jewelry collection.